I am involved in two new and exciting projects at Hebrew U that although at some distance from academic Talmud, may be of interest to some readers of this blog. 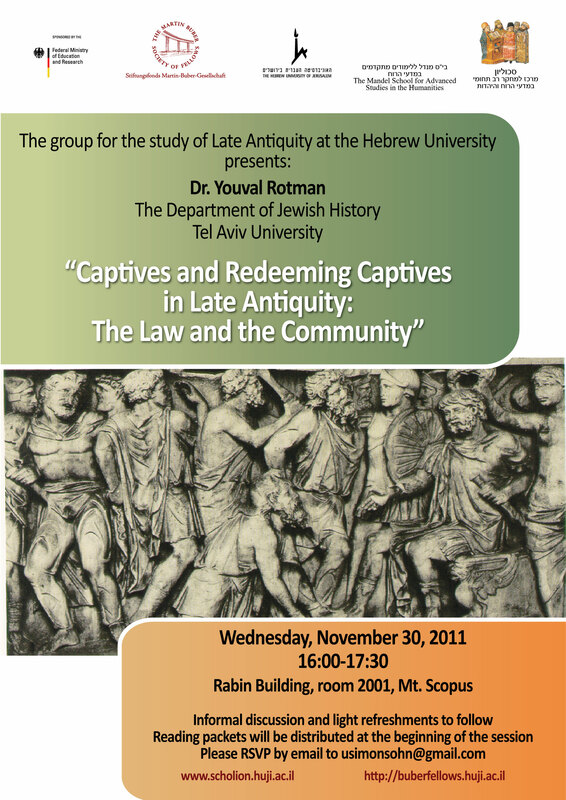 The first is the Group for the Study of Late Antiquity organized by Uriel Simonsohn and I. This is a series of working seminars for late antiquists at Hebrew U and other Israeli universities to get together, read texts and discuss new research projects over wine and cheese. Each meeting will be lead by a different scholar working on a different corner of the field. The first meeting will be held next week on Wednesday November 30. With Domenico Agostini and Eva Kiesele I also have begun a project of reading and translating a fascinating Middle Persian text entitled Zand ­fragard ī jud-dēw-dād. This text lay languishing in manuscript (and facsimile) until quite recently, when Goetz Koenig discussed it at an Iranian studies conference, and Yaakov Elman, P. Oktor Skjaervo, Mahnaz Moazami, Yishai Kiel, and I were drawn to it – mainly on account of its legal sophistication. This is a work that bears some as yet undefined relationship to the Pahlavi Videvdad – a Zoroastrian Middle Persian translation and “midrash” on an Avestan book of that name largely concerned with the laws of ritual impurity. Aside from its rabbinic-like legal conceptualization and reasoning, I have already written about its great potential for illuminating the way in which Middle Persian texts were redacted during the Sasanian and early Islamic period, and perhaps even the Bavli. Before anything, however, we need to carefully read through all 250 pages of it.